Hi everyone! I hope you are doing great!! Here you have today’s recipe. It’s perfect to celebrate this 5 de Mayo or for any other day of the week! I hope you can give it a try!! Enjoy!! In a large skillet, on medium high heat, heat up half a tablespoon of extra virgin olive oil, and cook the bacon for about 3 minutes, then add in the chorizo, make sure to break down the chorizo really well so you won't end up with big pieces of chorizo. Cook this for 5 more minutes. After five minutes, add in the pork, and cook on medium high heat for 10 minutes, stirring frequently. After 10 minutes, then add in the ground meat, and continue to cook on medium high heat for 10 more minutes, stirring frequently. Season the meat with chicken flavor bouillon, salt and pepper to taste, stir well, and continue to cook on high for 5 more minutes. After 5 minutes, add in the chopped turkey franks and chopped ham. Toss together, and cook for 3 more minutes on high. Reduce the heat to medium, then add in the minced Garlic and the chopped onion, stir for 30 seconds, then add in the chopped Bell Peppers, continue to cook for one more minute. Then add in the Chipotle Peppers, try to mince the peppers with the spoon as much as you can and then add in the Tomato pure, also add in about half a cup of water, stir until combined, continue to cook for 3 more minutes to warm up the tomato pure. Taste the flavor add more salt and pepper if needed, or you can also add in more chipotle peppers. Once you are happy with the flavor add in the chopped pineapple, toss together, cover with a lid, and continue on high heat for 5 more minutes or until it comes to a boil. 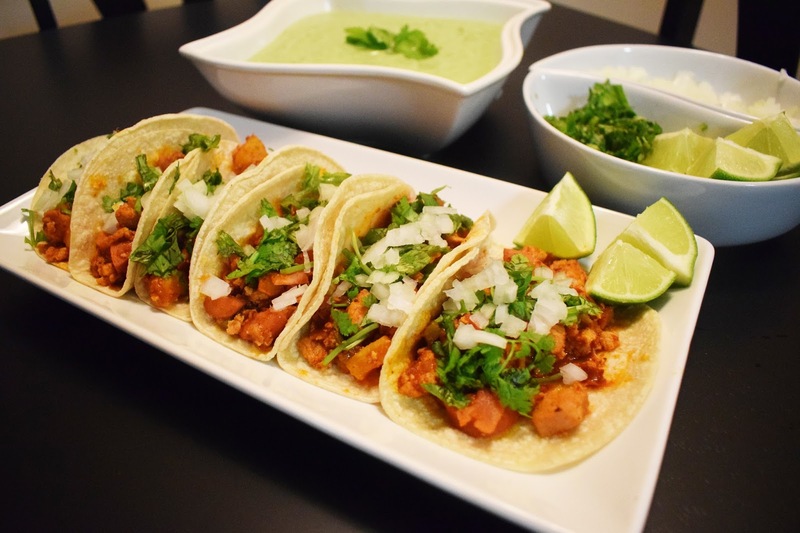 Top your tacos with chopped cilantro and chopped onions. Serve with your favorite Salsa and lime wedges!